A simple detach tool that explodes the selected objects into their elements. A small tool for quickly exploding all selected splines and shapes elements into separate objects. Support for turning on and off Undo for speeding up the process. ---- Normalize file Path of render elements. ---- Change all or selected render elements extensions to unique extension, and extension can be diferent that file name OutPutPath render. 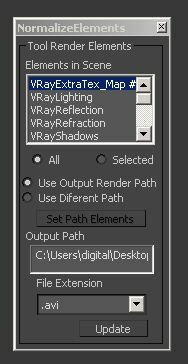 ---- Set a diferent path to render elements and output render. Manages the creation of VRay Light Select Elements based on a layer naming convention. All lights on a layer will be included in that Light Select Element. Layers are found by matching the pattern of the nameTag variable. 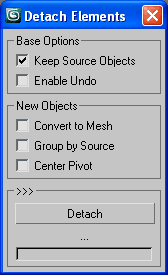 You can change this variable if necessary for your pipeline by using the slender button at the top of the dialog.